Heated conservations between referees and Premier League players during matches will be recorded and stored within the next month. Although the recordings will not be made public, the Premier League and FA will use them to protect referees in disciplinary cases in future. 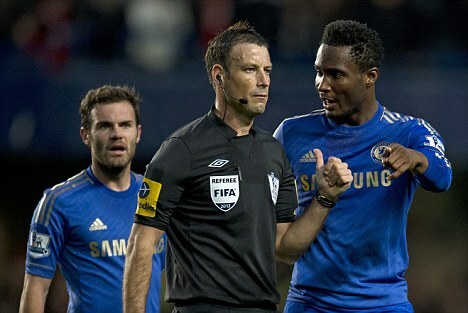 Referees chief Mike Riley is looking to introduce the new equipment in the coming weeks after Mark Clattenburg was cleared of racist abuse towards Chelsea player Jon Obi Mikel. That original report was made to the FA by Chelsea player Ramires after the game between Chelsea and Manchester United which was not recorded on equipment used by referees now. Premier League chiefs are now ordering new equipment so referees performances will be available and stored digitally after games. The same system is used by rugby referees and their match performances are available for public broadcast during games. But Premier League games will be kept private.